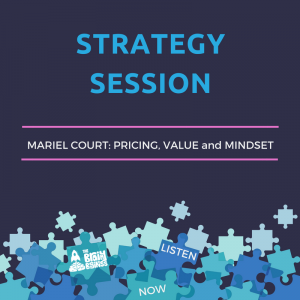 In this behavioral economics podcast it is time to apply what I have been talking about in the first 9 episodes through this very first on air strategy session, featuring my guest Mariel Court. Mariel is someone I met in the BizChix Coop (which is Natalie Eckdahl’s Facebook group). We started a conversation when Mariel posted about rebranding her business. I have a background in branding and wanted to be a resource for her, so we became accountability buddies. Today, we showcase what incorporating behavioral economics into your business looks like. We ask questions to get at the core of what Mariel really wants. This is a real conversation in the form of a virtual strategy session. Mariel is the owner of Gypsy Moon Piercing (a body piercing and fine jewelry studio in Medford, Oregon). Today, Mariel shares her two biggest issues which are changing her name and talking about pricing. We focus on pricing and I provide recommendations incorporating behavioral to frame the issue. [05:48] Melina wanted to be a resource for Mariel, plus she was going through her own rebrand. [06:18] An on air strategy session showcases what incorporating behavioral economics into your business can look like. [07:15] We ask questions to find out what Mariel really wants. [07:36] This is a real process with no boxed solutions. [08:23] When someone books a virtual strategy session with me, it is conducted via a recorded video chat, which I provide to the client after the call for added value. [08:44] Mariel Court is the owner of Gypsy Moon Piercing, a body piercing and fine jewelry studio in Medford, Oregon. [09:03] Mariel’s two biggest issues are the name change for her business and talking to people about pricing. [09:22] Sometimes Mariel feels that she is apologetic when explaining pricing to people, but it is also expensive to run her business. [09:56] She charges a $35 fee plus the cost of jewelry. Gold starts at $70 per piece. [11:34] Gold is handcrafted and a lot more can be done with it. [11:56] When buying gold jewelry, it will probably be more in the $150 to $200 range. [12:06] In the world of anchoring and adjustment when people hear “starting at $70” they will think the price should be $70 (or less). [13:29] Mariel feels she loses about three quarters of the phone calls that are about pricing. [14:45] Getting the caller to answer personal questions may be a better approach than talking about pricing right off the bat. [17:05] After finding out what the caller wants, recommend something more affordable like silver colored jewelry to keep the cost down. [17:57] Parents want to know that someone is going to take care of their kids. Put the parents and the kids at ease. [18:58] Use the person’s name and pick out some jewelry that they may like. [21:56] We had a key turn in the conversation. Mariel’s concern was talking about pricing, but it became clear that it was more of a mindset issue about how she approaches the pricing discussion. People ask about pricing because they don’t know what else to ask. That is relativity which I talked about in episode 5. [22:38] The subtle shift of talking about value instead of price (covered in episode 8). [24:41] The value Mariel provides is with her impeccable taste in jewelry and her experience and how much she cares about people. Her reviews show this. [25:51] If you say the price apologetically, people will think you’re overcharging them. [29:35] People buy on emotion. You want them to fall in love with the product before you ever talk about pricing. [31:23] Piercing could be a special day for moms and their daughters and become a really important memory. [33:55] Mariel does more jewelry sales than she does piercings. [34:21] She has an active Facebook group even though it’s only three months old. [35:38] Choosing whether to focus on kids or adults and building an experience around that focus (pick a niche/avatar). [37:44] KEY POINT: Selling the experience as opposed to selling the price of the jewelry. [41:14] The subconscious relies on emotion. Find the things that make them want to come in before they even visit the shop. [43:33] Once people have committed to a certain package, Mariel can show them upgrades, and they will feel like they are only paying the difference. [43:59] I would love to hear what you moms in the audience think about the suggestions we talked about. Would you pay more for the “princess” experience? Let me know in the comments. [44:35] KEY POINT: Incorporating behavioral economics into your business doesn’t have to cost a lot. There are small things that can make a big difference. [44:47] Look at the brain’s natural decision-making process and find the right way to incorporate your business with that. [45:04] The queen package I mentioned is a high anchor with relativity to make the princess package look more attractive. Listen to episode 5 for more on that. [46:37] BONUS! Because this is episode 10, I want to do a 10% off special for all my listeners! This can be applied to a virtual strategy session or the workshop I have coming up in Seattle on October 24th. [46:46] If you want to take advantage of 10% off a virtual strategy session, schedule a 15 minute consult call (which is free) by September 30, and if we end up working together, I will apply that 10% to whatever we deem is the best solution for you.